A key tenet of the Fourth Industrial Revolution (Industry 4.0) is the rise of automation, robotics, and A.I. There will be fewer jobs for humans. Who will most likely be affected? Which skill sets will employees need to develop between now and 2030 in order to stay relevant in this new world? A recent report from the McKinsey Global Institute has attempted to answer these questions. The report splits all work skills into five major categories: physical and manual; basic cognitive; higher cognitive; social and emotional; and technological. It then looks at the change in the total number of hours used to perform those skill sets between now and 2030. 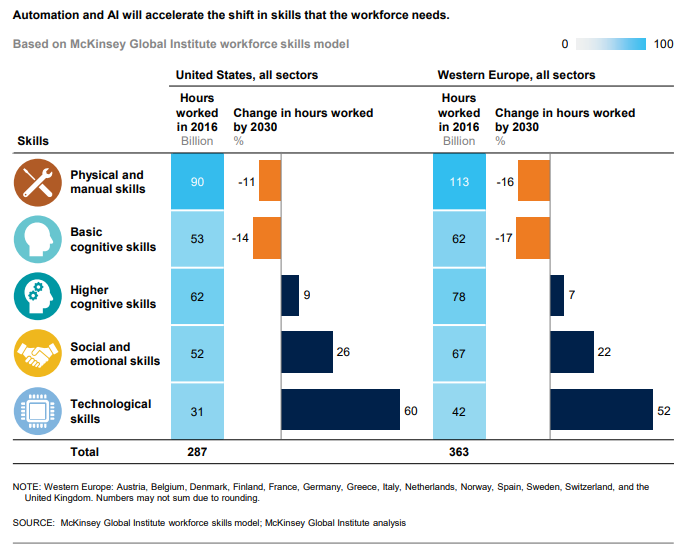 The two skill sets that will have the most dramatic decrease in demand in the U.S. and Western Europe are physical and basic cognitive skill sets. In other words, workers whose jobs consist mostly of these two skill sets will most likely be affected. Physical and manual skills can be performed by both relatively unskilled workers such as drivers and assembly line workers and skilled workers like nurses and electricians. Basic cognitive skills are required for jobs like cashiers, typists, and clerks. According to the report, the total number of hours performing physical and manual tasks in the U.S. in 2030 will reduce by 11% from 90 billion hours in 2016. Likewise, Western Europe’s current 113 billion hours of manual tasks will decrease by 16% by 2030. Similarly, the number of hours used for basic cognitive tasks will be cut by 14% and 17% in the U.S. and Western Europe, respectively. It should be noted, however, that the shifts will not play out equally among all sectors. “Healthcare, for example, will see a rising need for physical skills, even as demand for them declines in manufacturing and other sectors,” the report found. Conversely, the report indicates there will be significant increases in demand for the other three skill sets. Higher cognitive skills are used by doctors, accountants, research analysts, writers, and editors. These professions require advanced literacy and writing, quantitative and statistical skills, critical thinking and complex information processing. Social and emotional skills, or so-called “soft skills”, include advanced communication and negotiation, empathy, the ability to learn continuously, to manage others and to be adaptable. These skills are essential for business development, programming, emergency response, and counselling. Technological skills encompass IT skills, data analysis, engineering and research. These are the skills that are most sought after as companies are increasingly looking for software developers, engineers, robotics and scientific experts. 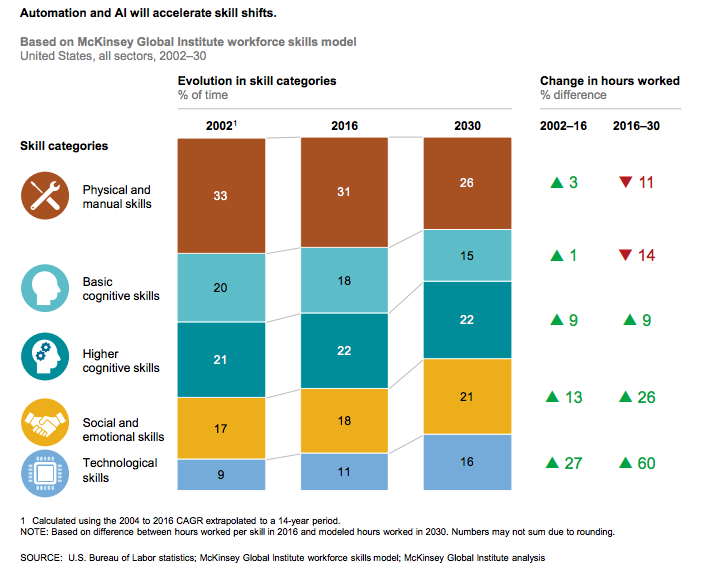 According to the report, “demand for higher cognitive skills such as creativity, critical thinking and decision making, and complex information processing, will grow through 2030 at cumulative double-digit rates. Read more: Why HiPos at Apple, Netflix and Google are 40 per cent more productive? The demand for social and emotional skills in the U.S. and Western Europe will rise by 26% and 22%, respectively, by 2030. But it is the technological skill set that will have the biggest increase in demand, 60% in the U.S. and 52% in Western Europe. “Competition for high-skill workers will increase, while displacement (losing or moving jobs or having insufficient work) will be concentrated mainly on low-skill workers, continuing a trend that has exacerbated income inequality and reduced middle-wage jobs. Companies say that high-skill workers are most likely to be hired and retrained, and to see rising wages,” the report states.